To prove themselves to the Pathfinder Society, Valeros the fighter and his companions must recount tales of their early exploits in a world beset by magic and evil. Thrill to the solo adventures of Valeros, holy warrior Kyra, Seoni the sorcerer, martial artist Sijan, Harsk the dwarven ranger, and Ezren the wizard, as they journey treacherous lands, survive wild creatures and fairy magic, unearth ancient threats, and prove their heroism time and time again! 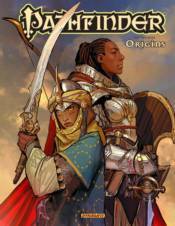 With six captivating stories (each connected by a common narrative thread) and explosive artwork, this fourth volume in the Pathfinder graphic novel series expands upon the mythos of Paizo's award-winning fantasy world, fiction line, and tabletop RPG. The collection features Pathfinder: Origins issues #1-6 by Erik Mona (Publisher of Paizo Publishing, LLC), game designers James L. Sutter and F. Wesley Schneider, and artists Tom Garcia, Kevin Stokes, and Leandro Oliviera; a cover gallery of 30 beautiful images; twenty-four pages of characters and world detail for the Pathfinder RPG, and a removable poster-map of the region explored in the graphic novel.